Do you worry about the amount of scams that are around on the Internet? Thanks to The Little Book of Big Scams you won’t have to worry anymore! Thanks to the Metropolitan Police and Barclays Bank, you won’t ever have to worry about that email you received offering you a cheap holiday being a scam again. “The Little Book of Big Scams” will teach you how to protect yourself from these scams. This “Little Book” includes whole host of scams and what you need to do to to avoid them. Identity, courier, holiday and even “mass market fraud” – the lure of a surprise big win, find out when they are really just another scam. 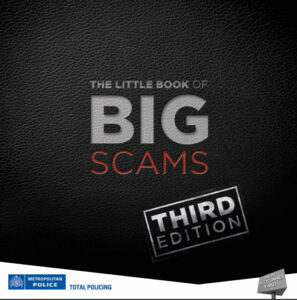 This book covers everything from investments to mobile phones, door to door to ticketing scams and will show you exactly what you need to look out for and what you can do when you see a scam. You’ll be able to protect your Bank account, your computer, and all your personal details with “The Little Book of Big Scams” top tips to spot the worlds biggest scams which are tricking people worldwide today. Follow this link to find everything you need.